To say we've seen an unusually active weather pattern lately would be a huge understatement. Today's not looking any different, either. 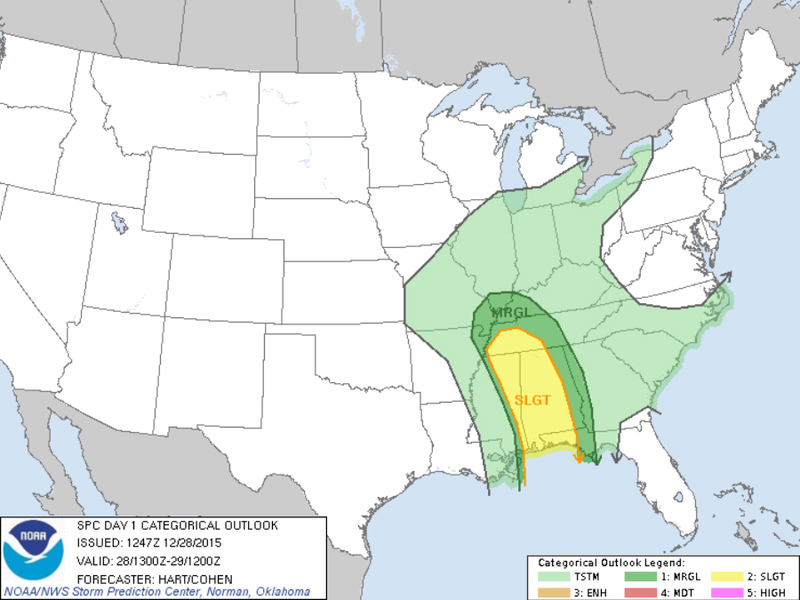 The same weather pattern that's been in place for the last week is bringing another chance for nasty weather to parts of Mississippi, Alabama and Tennessee today. Tornadoes and damaging winds are the biggest threat along this cold front. Behind the front, much colder air, accompanied by snow and ice, is replacing the mild air that dominated the Christmas holiday. This whole pattern has made for a very unusual end of the year. Since Dec. 21, the United States has had 278 severe weather reports, including 234 wind reports, 42 large hail reports and 56 tornado reports, including the fifth most active tornado day of the year on Dec. 23. Thankfully, today looks like it'll be the last day of really nasty thunderstorms. The weather system responsible for today's outbreak is moving to the north and east, eventually making its way into the Atlantic, and after that, a calmer, colder weather pattern will settle in.